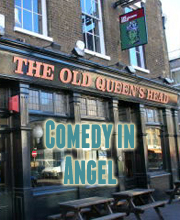 Laugh Out London comedy club brings you a top comedy night at one of the best venues in London – the Camden Head in Camden. The most exciting up-and-coming comedians in London doing both tried and tested material as well as newer less well tested material. Doors are 8pm for an 8.30pm start. Set to appear on the Stewart Lee-curated Alternative Comedy Experience, Nish is making a name for himself as one of the most exciting emerging talents in UK comedy. He’s taken two crtically-acclaimed hours to Edinburgh already, exploring his relationship wiht his family, his cultural identity and being mistaken for Guardian journalists. An award-winning stand up comedian, writer, and one third of the critically acclaimed sketch group Jigsaw (alongside Dan Antopolski and Nat Luurtsema). He’s been on Live At The Electric (BBC3), Russell Howard’s Good News (BBC3), Sketchorama (BBC Radio 4), Rhod Gilbert’s Jest A Minute (BBC Wales), Phil’s Ill (Dave) and Arthur Smith’s Comedy Club (ITV), and has written for Mock The Week (BBC2), Stand Up For The Week (Channel 4) and 8 out of 10 Cats. Surreal character and whimsy. He’s appeared on E4’s Show and Tell with Chris Addison and he’s met Arsene Wenger. The star of Weirdo’s pantomine of Steven Speilberg’s Hook, playing the bewigged Captain James Shirley Hook with terrifying hilarity. We don’t know what he’s going to do.